Binge eating disorder (BED) is a somewhat common type of eating disorder — affecting middle-aged woman more than any other group — that’s different than other well-known eating disorders like anorexia or bulimia nervosa, although has some things in common with both. 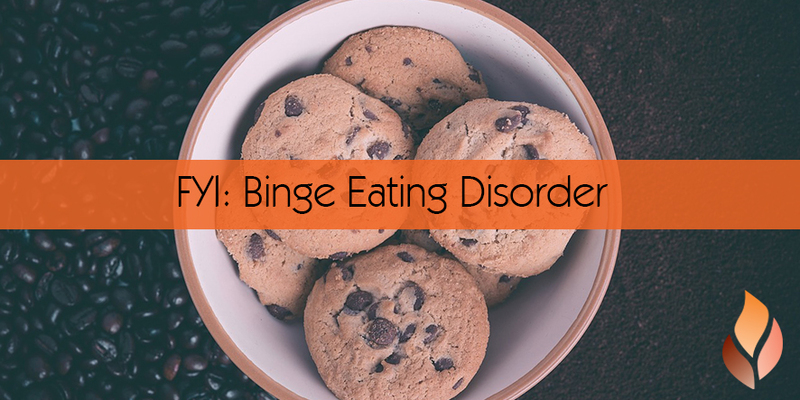 What is “binge eating” (or binging) exactly, and how is binge eating disorder defined? Many people who have had binge eating disorder describe it as a cycle of that feels very out of control: binging (often on unhealthy foods that have been deemed “off-limits” or forbidden), followed by feelings of intense shame and guilt, often followed by self-hatred, intense dieting and restricting, and then more binging. For many people with binge eating disorder mindful eating feels very difficult, and thoughts about food, body weight and eating are near-constant: Did I eat too much? Do I need to restrict? When should I eat again? What should I eat next? Why can’t I just stop eating? Why am I so out of control around food? Research shows that oftentimes people with eating disorders don’t fall neatly into one category/diagnoses and tend to display more than one type of abnormal eating behavior, in addition to symptoms of depression and anxiety. For example, it’s common for people with all types of eating disorders to engage in behaviors like overeating, restricting, purging, over-exercising, or taking laxatives or diet pills from time to time. Experts believe that even when someone struggles with binge eating disorder (or is an emotional eater/overeater who doesn’t have a diagnosable eating disorder), he or she likely also restricts food intake and diet frequently. In fact, dieting, obsessing about weight, displaying symptoms of orthorexia, viewing certain foods as forbidden and going too long without eating are all behaviors that increase someone’s chance of developing binge eating disorder. Childhood trauma (abuse, neglect, etc. ): It’s a common theme along people with eating disorders, including BED, to have experienced difficult childhoods. Many people with binge eating problems report turning to food for comfort from a young age and having difficulty breaking this habit into adulthood. Several forms of professional therapies have been shown to greatly help people struggling with binge eating. These include family-based treatment, adolescent-focused treatment and cognitive behavioral therapy (CBT). CBT is considered by many experts to be the gold-standard approach to treating and managing eating disorders because of how it addresses underlying thought patterns and beliefs that drive compulsive behaviors, shame and anxiety. A therapist or nutritionist can help you establish an eating plan that seems manageable long term, meets your calorie and nutrient needs, but still allows room for indulgences and treats. Aiming to eat the “perfect diet,” forbidding or strictly avoiding certain foods, and only focusing on your weight (as opposed to the big picture of your mental and physical health) can actually backfire in the long run. Experts on eating disorders advise that eating for comfort or emotional reasons on occasion is actually normal and not necessarily a bad thing, as long as the food does not become the main source of comfort. Experts agree that the underlying issues driving eating disorders and binge eating are compulsive behavior and the inability to handle difficult feelings, situations and thoughts. Stress can often trigger the need for people to comfort themselves, and as we all know, “comfort food” is widely available and often used in this way. Learning to manage stressful situations or tough emotions without turning to food can feel overwhelming and like a long road if it’s a very ingrained behavior, but it’s essential for recovering from any eating disorder, including BED. One of the best things you can to boost your odds of recovery long term is to establish and practice several other ways to soothe yourself and relieve stress during difficult times. Different things work for different people, but studies show that effective stress-reducing techniques include regular exercise, meditation and yoga, listening to music, spending time with other people, reading and writing, being outdoors in nature, and keeping up with fun hobbies. You can start gathering support by telling just one person who is close to you about what what you’re going through, becoming educated about BED and joining a support group online. Many BED support groups worldwide can be found through the Binge Eating Disorder Association’s website. Most people who would consider themselves totally “normal eaters” eat for emotional reasons from time to time (not because they’re hungry). This can happen on occasion when dining out with friends, in social situations, on holidays or during vacations. Some people also overeat frequently even when they’re no longer hungry to deal with feelings like boredom, sadness, being tired or feeling anxious. But occasionally overeating, eating unhealthy foods or eating for emotional reasons is usually not harmful or destructive in the scheme of things if people are otherwise taking good care of themselves and sticking to clean eating the majority of the time. behaviors or lie about their food intake, and spend abnormal amounts of time thinking about food and eating. People with binge eating problems might wait years before they tell anyone — and sadly, the longer it goes on, and the more that people have trouble stopping eating when they’re full and recognizing satiety, the harder the cycle of BED can be to stop. In the DSM-IV (the standard system for classification of mental disorders used by mental health professionals in the U.S.) what’s now called “Binge Eating Disorder” used to be classified under “Eating disorders not otherwise specified” (also called EDNOS, which is now the most common type of eating disorder worldwide).